Redfield, originally known as Selby Lodge, was built after 1840 for Edward William Selby-Lowndes. It replaced Dudslow or Mobbs' Farm, an enclosure farm, part of the Selby-Lowndes estate. It also incorporated Heighton's Farm, which was bought by William Selby-Lowndes in 1865. DARING BURGLARY. – During the night of the 11st inst a most daring burglary was committed in the house of Edward Heighton, Esq. in the Parish of Winslow, situate by the side of the turnpike-road, leading to Great Horwood. The villains lighted two wax candles, and procured some beer from the cellar, which they drank in the parlour; they afterwards proceeded to Mr. Heighton’s bedchamber, and took his small clothes from under his pillow, without awaking him, abstracted his keys from the pocket, and commenced rifling the house. Mr. Heighton’s housekeeper hearing them, aroused her master, when the villains decamped, taking with them £64 10s. in gold, three watches, and a great quantity of plate, the whole of which amounted to about £200, with which they made their escape undiscovered. After Edward Selby-Lowndes' death in 1885, the estate was auctioned in London and purchased by Henry Lambton. Particulars, Plan, and Conditions of Sale of the Highly Valuable and Attractive Residential Estate, distinguished as SELBY LODGE in the Parishes of Winslow and Great Horwood, comprising a Very Superior Family Residence, excellent Domestic Offices, extensive Stabling 166a 3r 17p of First Class Pasture and Arable Land, beautifully situate in a ring fence, about half a mile from Winslow Station, on the Oxford and Banbury Branch of the London & North Western Railway. Also an excellent Brick Yard containing 3a 1r 39p. To be Sold by Mr Geo Wigley, at the Mart, Tokenhouse Yard, City of London, on Tuesday, July 21st, 1885, at Two o'clock precisely, by direction of the Trustees of the late Edward William Selby Lowndes Esq. Particulars with plans, and orders to view may be obtained of Messrs Willis & Willis, Solicitors, Winslow, or of Mr Geo Wigley, Land Agent, Winslow, Bucks. On the Ground Floor, A lofty Entrance Hall 42ft. by 9ft 9in. Dining and Drawing Rooms each 20ft. by 24ft. Morning Boom 15ft. 9in. by 15ft. Gun Boom. On the First Floor, 6 principal Bedrooms, 2 of which are 20ft. by 24ft., Dressing room, 5 Secondary Bedrooms with spacious Corridors and Landing. The Domestic Offices, comprise Housekeeper's Room, Butler's Pantry, Servant's Hall, Store Room, large Kitchen, Scullery, Larder, and 3 capital Ale and Wine Cellars in the basement. Detached brick and slated Wash-house, Men's Mess Room. Shoe and Knife House, Coal House, Hen-house and Potato Room. The Whole is in a first-class state of cultivation, having been highly farmed by the late Proprietor for half a century. The Grounds are particularly well fenced with thriving hedge-rows. The Grass Land is of excellent feeding quality, and a most invaluable feature of the property is that every ground possesses a never-failing supply of water. The Arable Land is of a most productive character and grows the finest crops of Wheat, Barley & Roots. There is a Brick and Tiled open Hovel, Chaff-house, and feeding house in No. 5. There are also two Brick and Tiled open Hovels and Rickyard in Nos 21 & 22. The Estate is bounded by the handsome Turnpike Road from Buckingham to Aylesbury, and also by the Road from Winslow to Stony Stratford. Following his purchase of Selby Lodge in 1885, Henry Lambton rebuilt the front of the house in red brick and renamed it Redfield. He extended and developed the Redfield Estate, building distinctive estate-workers' cottages on the Great Horwood Road. Redfield was a centre for foxhunting, and outdid Winslow Hall as the town's most opulent residence. There is no hunting tomorrow owing to the death of Mr Lambton, a prominent member of the hunt, so I shall be back in time for luncheon. I understand that fifteen of the late Mr. Lambton's horses and hunters are being submitted to public auction this week, which will bring the Redfield stables down to half their normal number of horses. The name of Redfield having become quite a household word in Winslow, the following note from the pen of Mr. Clear, senior, may not be out of place:— The late Mr. Lambton, a few years since, erected a commodious mansion at Winslow upon a site then known as "Selby Lodge," but formerly as "Mobbs's Farm." This residence he designated "Redfield;" but it so happens that this appellation is a somewhat historical one at Winslow and long attached to another site in quite a different part of the parish. It is generally considered that the word "Win" at the beginning of the names of places comes from the Saxon "Win," a battle, or fight, and denotes that some battle had been fought there. In like manner the prefix "Red" applies to the immediate spot where such battle occured. In the Hamlet of Shipton is an old farmhouse known as "Red Hall," and the land adjoining is designated "The Red Field" in the Enclosure Act, 1743. This would seem to indicate that there was the probable spot where in long past days a severe engagement may have taken place between some of the Saxon tribes. Living in cottages and stables on the estate were a stud groom, gamekeeper, gardener / bailiff, coachman, 6 grooms and 2 under-gardeners. The Lambton family occupied Redfield until it was requisitioned by the Air Ministry during the Second World War. After the War, Buckinghamshire County Council bought Redfield for use as a tuberculosis hospital. In fact, the County Coucil used it as an old people's home and divided the land was into smallholdings. The following extracts from the County Council minutes of the period show the diligence of the Council and its officers in fulfilling the terms of the various Acts of Parliament governing welfare and agricultural affairs. Your Committee have for some time been endeavouring to find suitable premises to provide additional accommodation for cases of pulmonary tuberculosis, and have recently entered into negotiations for the purchase of a property known as Redfield, Winslow. These premises comprise a Georgian mansion, with five reception rooms and twenty-seven bedrooms, and an estate of 185 acres with cottages and farm buildings. Fifty-nine acres of the farm land are let to a tenant, but vacant possession of the remainder will be given on completion, and your Committee are of opinion, that the latter area could suitably be used as a farm ancillary to the institution. The property would provide accommodation for between fifty and sixty patients. Negotiations were still proceeding at the date of your Committee's meeting, and the necessary recommendations are being submitted through the Finance Committee. With reference to your Committee's report to the Council in May last the purchase of Redfield, Winslow, for the purpose of providing additional accommodation for cases of pulmonary tuberculosis was completed on 7th October last. Negotiations are now taking place with he Air Ministry regarding the purchase of fittings installed by them in the premises when they were requisitioned by the Air Ministry, and the County Architect is preparing plans and estimates of the adaptations and alterations necessary to fit the property for its intended use. In the meantime your Committee have made arrangements to continue farming that part of the estate, amounting approximately to 131 acres which is in hand. The County Land Agent has agreed to supervise the farm, and a Sub-Committee has been formed to which all questions relating to it will be referred. 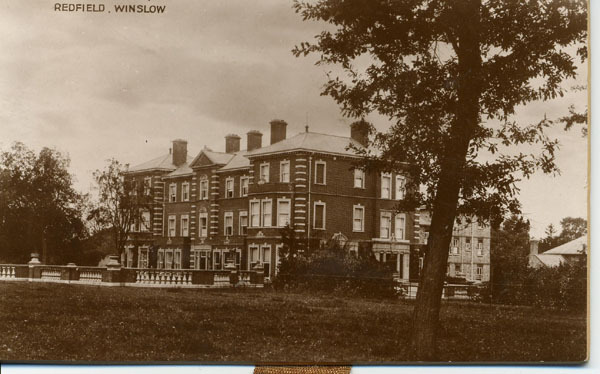 With reference to your Committee's last report, the Minister of Health, has now formally approved the appropriation of the mansion house, gardens and surrounding land at Redfield, Winslow, for the purpose of Part III of the National Assistance Act, 1948, in order that it may be adapted for use as an old persons' hostel. Your Committee have accordingly given instructions for the preparation of detailed drawings and bills of quantities with a view to tenders being invited for the work of adaptation for which the Council approved an estimate of £18,000 at their last meeting. The Small Holdings Committee have now obtained the approval of the Minister of Agriculture in principle to the appropriation of 156.462 acres of the farm land at Redfield for small holdings purposes, and have accordingly asked your Committee to recommend the appropriation of this area. The Minister of Agriculture considers that the remaining area of 10.2 acres should not be included in the small holdings. This area is part of the park land through which the drive runs, and immediately adjoins some of the land included in the appropriation for welfare purposes. Your Committee therefore consider that this land should be added to the area held for welfare purposes, and will arrange for its letting as a bare land holding. The land would be managed for your Committee by the County Land Agent. (b) 10.2 acres of the park land which lies on either side of the drive at Redfield, Winslow, for the purposes of Part III of the National Assistance Act, 1948.
and that the sums to be transferred in the Council's accounts should be determined by the District Valuer. Your Committee reported to the Council in May, 1949, that they had appointed a small Sub-Committee to consider the use for small holdings of Redfield Farm, Winslow, which had been purchased by the Council for public health purposes, but was not now required for those purposes. After careful consideration, your Committee are satisfied that this farm is suitable for conversion into small holdings and the Ministry of Agriculture and Fisheries have approved, in principle, the appropriation of approximately 156 acres for this purpose. Your Committee, therefore, support the recommendation which appears in the report of the County Health Committee for the appropriation of this land for small holdings. Three holdings will be provided on this land and your Committee have already arranged tenancies as from Michaelmas next at rents totalling £474 10s. 0d. per annum. The estimated capital cost of equipping the three holdings is £6,700 and the estimated annual deficiency on the scheme, i.e., the excess of outgoings including loan charges, over income is £413, 75 per cent of which will be borne by the Ministry of Agriculture and Fisheries. Buckinghamshire County Council closed the old people's home at Redfield and sold the property 31 January 1978 to a housing co-operative. The successors of this Co-operative still own and live at Redfield.